A lot of the plants growing in our yard are volunteers - plants that self seeded or otherwise appeared on their own. 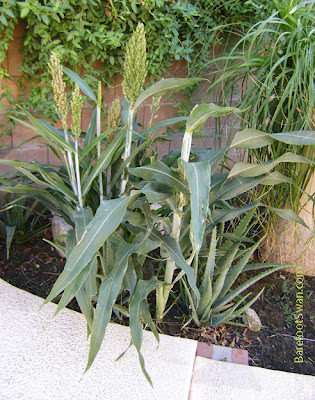 These volunteer plants tend to do pretty well, since they "chose" their own location. 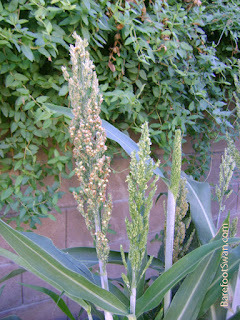 This is millet, which sprouted from spilled bird seed. We have let it grow to provide natural (and free) food for the birds. The seed heads can be left on the plant, or they can be cut and hung up at the bird feeding stations. Kind of neat how the new seed head emerges from the stalk of the plant. This green vine is probably a volunteer watermelon plant. We planted a small patch of watermelons in this area of the yard last season. It would be cool to get a second, spontaneous crop. 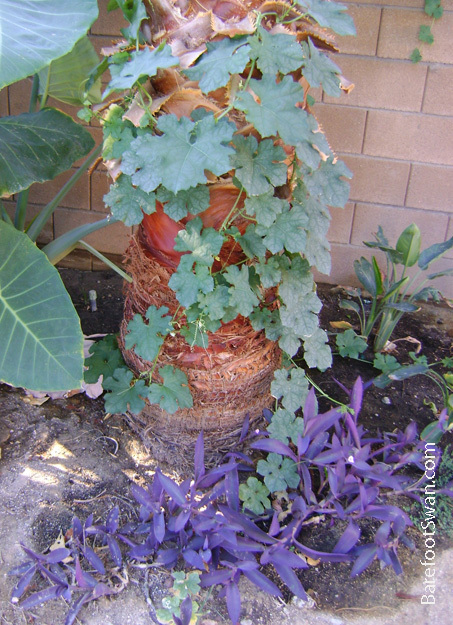 The vine is growing up a volunteer palm tree, which was "planted" by a visiting bird. 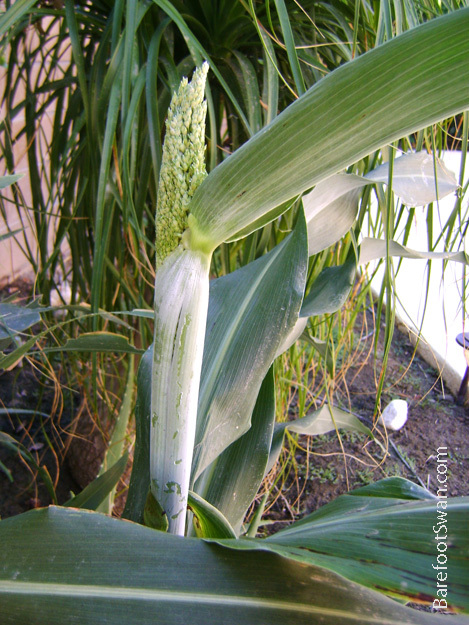 than what the gardener sows." Yesterday morning we heard a new bird calling in our front yard. We looked around and located the source - a beautiful bright reddish-orange bird with a black face and belly, perched high overhead on the telephone wires. I had never seen this bird in person before, but I immediately recognized it (thanks to time spent aimlessly perusing my N.G. Bird Field Guide). It was a male Orange Bishop. He was "loosely associating" with some House Finches, who were waiting for us to fill the bird feeders. I ducked back into the house for the camera, and took 2 really bad photos before he and the finches spooked and flew off together. The pics were super-zoomed and pretty blurry, unfortunately. We filled the bird feeders with hopes he would come back. Orange Bishop is native to sub-Saharan Africa. They are a member of the weaver family (Ploceidae), so-named because of the intricately woven nests they build. 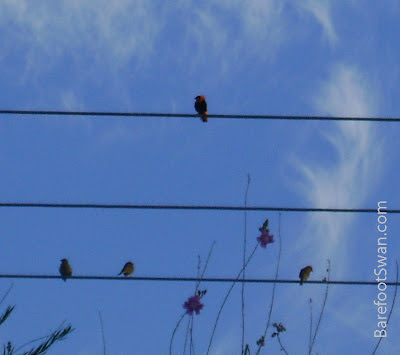 Orange Bishop is smaller than a House Finch (~4" vs. 6"). 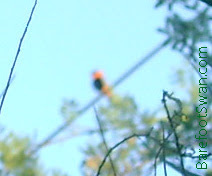 As previously mentioned, the breeding male is bright reddish-orange and black. Female is very plain, and is often compared to Grasshopper Sparrow in bird field guides. 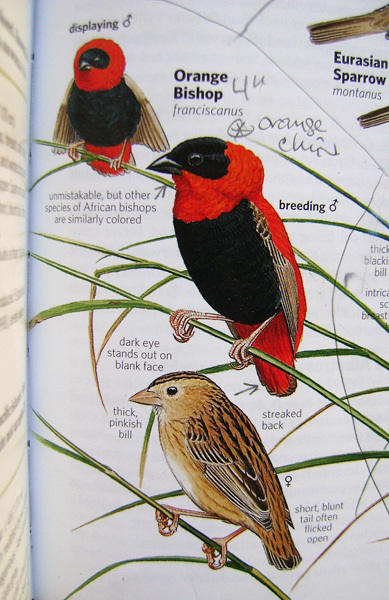 Orange Bishop has a thicker, conical bill - black in males and fleshy pink in the females. Their tails are short and blunt. Orange Bishop prefers open areas, especially tall grasslands near water. The species has become established in the Los Angeles area (1980's) and Phoenix (~late 1990's). This morning I went out to get the newspaper, and I heard the bird calling again. He was up on the phone line, in the same place as yesterday. I went back inside and got the camera. I took another bad picture, this time through a window and 2 trees. Here's how they actually look. They are really handsome birds. ANNOUNCER: "And now for something completely different..."
Today is the Autumnal Equinox, the first day of Fall here in the Northern Hemisphere. The sun's path across the sky has been moving steadily south since the Summer Solstice, the first day of Summer back on June 20th. It has been easy to notice lately that days are getting shorter. The sun is rising later and setting earlier than it did during the summer months. Temperatures are cooling off too. The shorter days and cooler temperatures mean lots of birds are on the move now. Our summer bird visitors have headed south for the winter. The White-winged Doves and Hooded Orioles left our yard a couple of weeks ago, headed to their winter homes. They will be replaced by our winter residents: White-crowned Sparrows and Yellow-rumped Warblers are the two most numerous in our yard. We will be keeping all of our feeders well-stocked, to welcome the snowbirds back and to help the travelers as they pass through. Back in June we posted a picture of sunset on the day of the Summer Solstice, when the sun is at its farthest point north in the sky. Here is a photo of the sunset today, looking due west. The sun's movement to the south is definitely noticeable. It will continue moving south until the Winter Solstice in December. Today be International "Talk Like a Pirate Day". -- Learn the history of TLAP Day! -- Take the Pirate Personality Test! -- Use the English to Pirate translator! -- Read the Pirate Advice column! -- Learn how to celebrate TLAP Day in your workplace! -- Listen to Pirate Music! -- Get Pirate ring tones for your phone! -- Subscribe to the Poopdeck newsletter! -- Find links to lots of merry mayhem and Pirattitude! 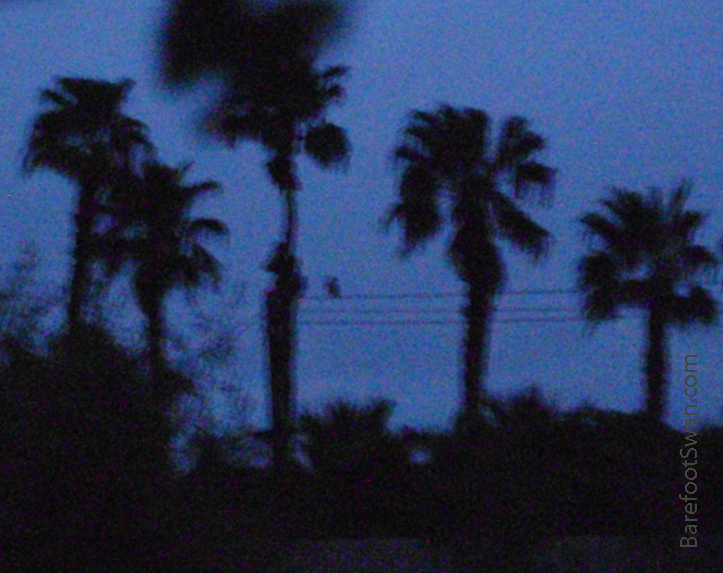 We were up before sunrise this morning, and noticed that a Great Horned Owl was calling from somewhere nearby. As we stopped to listen, we realized there were actually two owls calling back and forth to each other. The first voice had a slightly higher pitch, and the second was noticeably lower. It was still rather dark, as I quietly went outside into the courtyard. Looking in the direction of their calls, I saw one of the owls perched on a telephone line, silhouetted against the pre-dawn sky. It was the owl with the deeper voice and I could see its movements each time it called. The other owl remained hidden, but continued to call in its higher voice. I was able to watch and listen for a few minutes, before the high-voiced owl suddenly appeared. It took off from its hidden perch and silently flew south toward the big trees on the golf course. The owl on the wire followed a few seconds later. Pretty neat way to start the day. We're hoping they come back again for another visit. "O you virtuous owle, The wise Minerva's only fowle."